JBC Tools has recently released four new models of soldering tips. Three of these soldering tips are designed for soldering cables and connections. This is the bent version of the cartridge C245-061, which has a screwdriver shape. 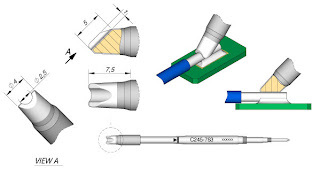 The design of this soldering tip allows the user to reach components that the straight version (C245-061) cannot. 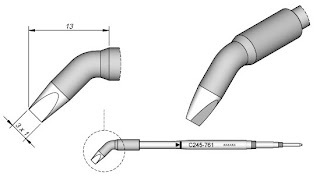 This C245 soldering tip is specially designed (thus, considered one of JBC's C245 Special Series tips) it is designed specifically for soldering cables and connections up to 2.5 mm in diameter. Additionally, this soldering tip is very similiar to the JBC C245-760. Finally, the 4th addition to JBC Soldering Series is a C470 cartridge. This is the recommended solution for soldering cables of 1 mm in diameter (max). It is additionally an appropriate option for soldering rows of pins of 1 mm (max) up to a total length of 10 mm (which is the also the size of the tip width). Janel Online is proud to be an Authorized Distributor of JBC Soldering Tools for over 13 years. To shop the complete JBC Tools Product Line JBC Tools Product Line.